After Kraton and Dreadnought, I finally get to listen to the third band coming from the infamous rehearsal space Bricherhaff, located somewhere in the middle of nowhere in Luxembourg. Sublind have been around since the mid-2000’s, and just like the two aforementioned bands, they don’t need the flashy amenities that the Rockhal and Kulturfabrik have to offer. The quintet does completely without any of the modern influences of most current bands, with the cartoonish cover artwork and the album title Thrashing Delirium hinting at what to expect. Vintage thrash metal may not be a new trend, after bands like Municipal Waste, Evile and Gama Bomb had quite some success with it, but it is still nice to hear that the genre has finally arrived in Luxembourg. Sublind have an undiluted mid- to late-Eighties thrash metal sound, located somewhere between the beer drenched insanity of Tankard and the more serious riffing of early Slayer. Everything has been kept quite simple, and deliberately so. The production, in charge of the band itself, is basic yet highly functional, enhancing the retro feeling of the music. What is most obvious about Sublind is that the guys have really tremendous fun playing their music. When I saw them at the Metal Battle a couple of weeks ago, they may not have had the best performance (but honestly, in my opinion, only Cosmogon fared better), but it definitely was the most entertaining one. 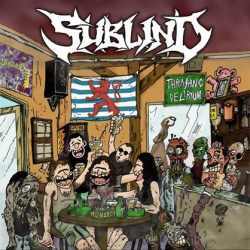 Sublind are at their best when they play fast-paced, straightforward thrash metal, like the exhilarating opener and title track that makes instantly hunger for more, and of course their already classic Humpeknupper, an ode in Luxembourgish language to their favourite hobby, next to playing thrash metal: drinking beer. The main topic of the lyrics is metal though (Thrashing Delirium, Metalmorphosis, Thrash It! ), and then it is of course a little disappointing that the more serious stuff (Warsaw) feels awry among the generally very good-natured material. Sublind are definitely a fun inducing thrash metal band, and they really should emphasise their fast and rowdy side to their more reflective one. As a debut longplayer, Thrashing Delirium is a total success. The songwriting is catchier than what most other metal bands come up these days, the production has a warm Eighties sound, the musicians are really impeccable at the thrash metal metier, and the vocalist has a pleasant, beer drenched voice that perfectly fits the overall atmosphere. For now I remain with “only” eight points, although I was very close to handing out an ninth one, and I am highly convinced that the future will be bright for Sublind, undisputedly one of the most promising bands from Luxembourg right now.